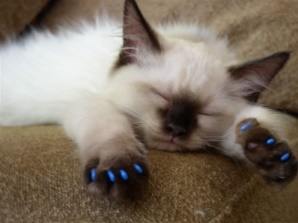 There is much debate regarding an owner’s decision to declaw their cat. With all the hype, what is the right decision? Unfortunately, the answer isn’t so black and white. It is important to educate yourself about what the procedure actually entails. 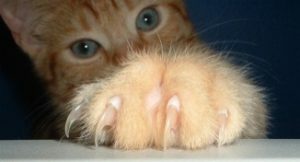 So, what is a declaw? A declaw is the amputation of the last bone of a cat’s toe. Unlike humans, a cat’s nail does not sit on top of their “finger”. In order for the procedure to have success, the veterinarian has to amputate the tip of the cat’s toes. This is the equivalent of amputating a person’s fingers down to their first knuckles! Because the procedure is an amputation, it is not uncommon to see pain, swelling, and even infection. Why do you want to declaw your cat? Most of the time, the answers are the same: “My cat is tearing up my furniture”. Other times, it is because the owner is immunocompromised and the procedure is necessary for the owner’s health and well-being. No matter what your reasoning is for considering the surgery, your veterinarian will want to have a clear picture so he or she will know how to proceed. What have you tried? Why didn’t it work? Scratching and stretching are normal behaviors. Most cats will continue the motions even after the surgery. So since you can’t stop it, what can you do to avoid surgery? Have scratching posts available. As with other behaviors, this may take some training. Play with your cat by their scratching posts, and have patience. Apply vinyl nails. These are easily applied, but do need to be replaced periodically. Provide plenty of enrichment (toys) and play time. A bored cat can easily become a destructive cat. Punishment rarely works. If anything, this can cause a lack of trust and other unwanted behaviors. Start them off young. It is easier to teach good habits versus correcting bad ones. More frequent nail trims. This will not do anything to thwart this bad habit, but it will take the edge off. Declawing is not right for every cat. Certain factors such as age and weight may increase the risks associated with this surgery. Outdoor cats and those that spend even limited time outdoors are not candidates for this procedure because it lowers their ability to defend themselves. Certain counties and states across the nation have banned the procedure. Although this has yet to affect us at this time, we recommend checking the rules governing your area. As always, speak to your veterinarian. Our dedicated doctors and staff are here to answer your questions and help you arrive at the right decision for you and your cat. For more information please visit www.avma.org.